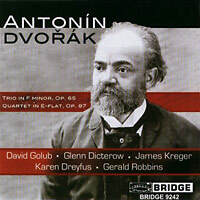 This fine disc of two Dvořák chamber works is dedicated to the memory of pianist David Golub, who died in 2000 at the age of 50. We hear Mr. Golub‘s art in the opening F Minor Trio (August 1970) from a live broadcast from the Marlboro Music Festival. Both dramatic and rhapsodic the F Minor Trio (1883) pulses with declamatory and lyric fervor. The cello part — passionately put forth by Kreger — possesses a decidedly virtuosic, solo character, and we feel that the Cello Concerto is already burgeoning in the composer‘s imagination. The violin’s figures often “revert” to Bohemian, Slavonic character, folksy, melancholy, and always poignant. This happy synthesis of the native and the classically formal makes Dvořák the natural heir of the Haydn / Beethoven / Brahms tradition. The ensuing Allegro grazioso (furiant) has the sizzle and leaping motor energy we hear in Dvořák’s “American” pieces, inspired by elastic impulses from Indian chant and long, scythe-like gestures. Golub’s tinkling contribution more than once has the pearly authority we recall from Mieczyslaw Horszowski. Again, the cello speaks for Dvořák’s songful soul in the Poco adagio, where Dicterow’s violin joins Kreger for several lovely intertwinings. The passionate sequences that occupy the middle section ring with Brahmsian sincerity. Dicterow’s violin soars up in league with cello and piano in a plangent way that only the Terzetto, Op. 74 and the slow movement of the American Quartet will imitate with any success. The last movement combines syncopation and high expressivity, a folk dance ripe for fugal treatment which doesn’t mind if it “settles” for being a Beethoven horse-race or a Chopin nocturne. Rousing audience thunder at the last note. The E-flat Piano Quartet (1889) of Dvořák possesses a Brahmsian melancholy, despite its moments of pastoral joy and exalted nostalgia. Rather martial in temperament, the first movement asks the Lyric Piano Quartet in their 1991 rendition to produce brilliant sounds, especially pianist Robbins, whose part certainly exceeds the awkward writing in the composer’s own concerto. A kind of love duet intrudes at two key moments, punctuated by throbbing strings and a decided piano pedal. The Lento is marked “molto espesssivo,” and this wordless song proceeds from the cello in somber harmony until interrupted by the violin in octaves and triplets, convulsively passionate. The pulsing pizzicati could have been lifted from Borodin‘s famed Nocturne. Robbins is permitted a bit of dreamy musing, answered by a plaintive James Kreger, almost a moment from a lost cello sonata. Another series of powerful declamations between piano and strings might owe something to Schumann while looking forward to the Dumky Trio. The spirit of Liszt’s gypsy music, an eclectic combination of waltz music — close to Viennese klezmer — hunting music, and Bohemian cimbalom or zither music, the sound not so distant from a honky-tonk moment in The Westerner. The Trio section, however, rips with Dvořák’s special form of furiant, cross-fertilized by Schubert’s harmonic edge. The da capo brings forth Dreyfus’ striking viola sound, here in duet with the cello. The viola’s rasping tone proves integral to the whiplash Finale, a folk dance with antique filigree. A laughing motif romps throughout, countered by another love theme, and then one of those amazing chorale tunes Dvořák’s late style commands at will. Schubertian counterpoint notwithstanding, a wicked mirth infuses the movement, and Robbins’ piano wants to snap our heads off at the neck. The last chords are nothing if not decisive.